One of my favorite photos from our trip to Chaco Canyon back in June with a short story to go along with it. On the day we were leaving the park to head home, Amanda and I were at the gate to get into Chaco Canyon about ten minutes before 7:00am – which is when they were supposed to open the gate (don’t even get me started about them closing the park in the first place….I would have loved to take some night shots in the park!). Then 7:00am came and went, yet no one was there to unlock the gate. I was getting anxious to get inside the park because I knew I would only have a small window of time to photograph this setting before the sun would be too high in the sky! Finally, about ten minutes after 7:00am, a truck drove up to the gate and finally unlocked it. I quickly drove into the park and headed straight for Pueblo Bonito. Once I parked the Jeep in the lot, I grabbed my camera gear and walked swiftly right to this spot. I setup my tripod and framed the scene and quickly took a few shots. I tried a few different compositions and then ventured further into the pueblo to get a few of the different doorway combinations. 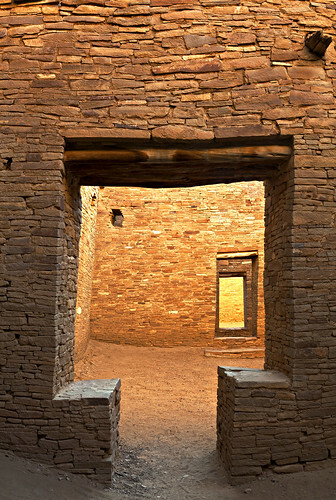 About 15-20 minutes after arriving in the pueblo the sun was too high in the sky and light was shining directly onto parts of the interior walls. Luckily, I had made it inside and got the shots I wanted before it was too late! Surprisingly, I was also the only one there during that time – I was expecting there to be other photographers showing up for similar shots.